Ubuntu provides debug symbol as dbgsym package. This article will describe installing dbgsym and debugging package. This article will debug bash with debug symbol. dbgsym package is published in ddebs.ubuntu.com. Add ddebs.ubuntu.com to repository list. Import GPG key of ddebs.ubuntu.com. The package which has a suffix of dbgsym provides debug symbol. In case of bash is as below. GDB will search /usr/lib/debug automatically even if you do not specify path of debug symbol. Ubuntu disables deb-src by default. You need to enable deb-src for downloading package source code. Install dpkg-dev package for dpkg-source command. In case of bash is as below. bash-4.4.18 is a source tree. 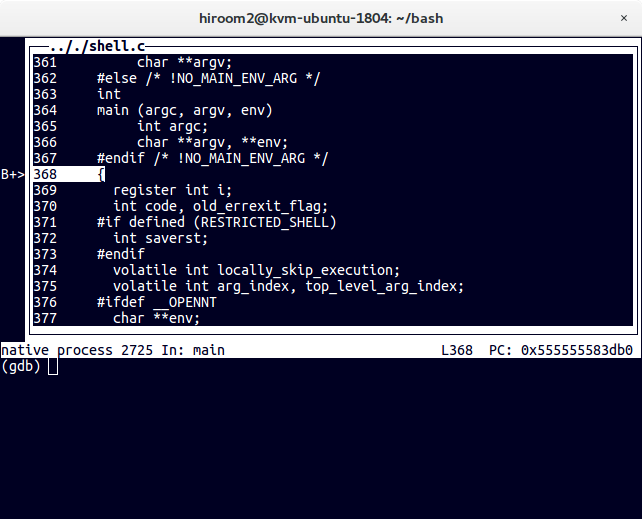 Run GDB with command and path of source code. Breakpoint 1 at 0x2fdb0: file .././shell.c, line 368. GDB command "la src" is useful for tracing source code.